If you have never had one, this is the best opportunity in the world to have a New Orleans Beignet at the Beignet Fest. A Beignet is the French term for a pastry that is fried dough sprinkled with confectioner’s sugar. There are a variety of different types and some even come filled with wonderful treats like chocolate and fruits. But, the one that most locals know about is simply covered in lots and lots of powdered sugar. And, of course, that wonderful powdered sugar always seems to get everywhere, from head to toe. 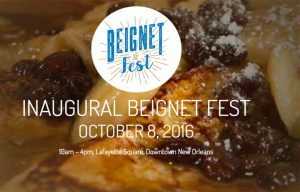 This weekend, on Saturday, October 8th, 2016, from 10 am -4pm, New Orleans is hosting the Beignet Fest at Lafayette Square. Beignet Fest celebrates New Orleans’ most iconic dessert: the beignet. From traditional sweet treats to savory delicacies that feature seafood, cheese and more, Beignet Fest 2016 is serving up the best beignets in the South. In true New Orleans tradition, Beignet Fest will feature a myriad of restaurant vendors; local and regional musical entertainment; and family-friendly activities in the Kid’s Village. The festival is free and open to the public with beignets and beverages available for sale. Awards will be given for best sweet, best savory, most original and crowd-favorite beignets. Proceeds from Beignet Fest will benefit the Tres Doux Foundation. The mission of the Tres Doux Foundation is to celebrate, embrace and enhance the lives of children with developmental delays and disabilities by presenting them as whole beings, and to support organizations that do the same.With proceeds from the Beignet Fest, the Tres Doux Foundation will make grants to local nonprofit organizations that provide for accessible, quality programs for children with developmental delays. Click here for more details about this festival. Don’t forget to stop by and have a little original Cajun food at Mulate’s Cajun Restaurant. Mulate’s is known as the original Cajun restaurant, famous for preserving and celebrating the food, music and culture found in the small towns and along the bayous of south Louisiana. But the restaurant that prides itself on being true to its roots would never have opened its doors if owner Kerry Boutté hadn’t ventured out of Cajun Country and into restaurants and dance halls of New Orleans, Houston and even Europe. There is a lot to learn about us, so just stop in an experience the original Cajun restaurant.